If you are in the right place at the right time in the Serengeti in Tanzania or the Masai Mara in Kenya, Africa's annual wildebeest migration is an awe-inspiring sight to behold. You can be in a sea of wildebeest and zebras at one point, then on key crossing points you might be witness to thousands upon thousands on wildebeest charging past you across a road. Or perhaps you could be at a river crossing point and watch the herds running the gauntlet of the waiting crocodiles - with your heart in your mouth! It’s hard to get your mind around 2 million animals on the move. The world’s largest mass land migration is just this though. Vast swathes of wildebeest, as well as huge numbers of zebras, plus Thompson’s gazelle and eland make the arduous journey from the Serengeti to the Masai Mara and back again. Wherever you see it, the utter scale of numbers (about 1.5 million wildebeest and 500,000 zebras) is overwhelming and dramatic, and frankly spine-tingling. They constantly follow the fresh grazing afforded by the rains. This circle of life includes birth, joyous moments of youngsters learning to play and love life, heart-in-mouth river crossings, dramatic narrow escapes from predators, and sadly, death. It’s raw, it can be emotional, it’s an incredible sight. When is the Annual Wildebeest Migration? December to March: Southern Serengeti. Ndutu region is the best place to come. April-June: Heading north and west. 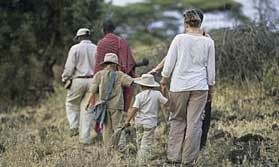 The Grumeti region is the place to be, but central Serengeti can also be very good. 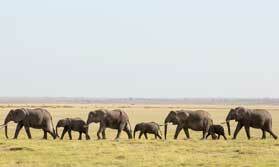 July-October: Northern Serengeti and Kenya's Masai Mara. November-December: Heading south, mostly via the eastern side of the Serengeti. There are known common points where the herd cross the rivers in their path, and the lodges close to these are always full when the migration is around. You never know when the herds will cross but this is one of the sights of the natural world which photographers and wildlife enthusiasts yearn to see. For the wildebeest it's a dangerous time though as crocodiles are waiting! 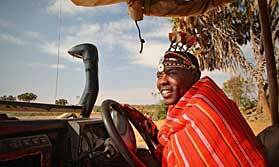 KENYA: In the Masai Mara, the migration herds cross both the Mara and the Talek Rivers. They don’t just cross once, but since they stay in the Mara for a few months from about July to October, they cross to and fro. 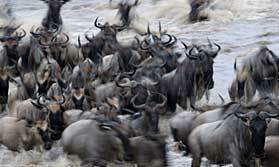 TANZANIA: In the Serengeti you might see a river crossing at the Grumeti River in the far west. This is most likely around May-June, though being dependant on the rains, can happen any time from about April to early July. The Serengeti is well-provided with accommodation though the properties are spread over a much larger area. It is much more important here to pick a lodge in the area where the migration is likely to be, as the distances concerned are vast. Southern Serengeti: Ndutu Lodge, Kirurumu Serengeti Camp, Lemala Ndutu, Olakira Camp (southern location). Central Serengeti: Dunia Camp, Nasikia Naona Camp, Kati Kati Camp. Northern Serengeti: Sayari Camp, Serengeti Mara Camp, Olakira Camp (northern location), Ubuntu Camp. 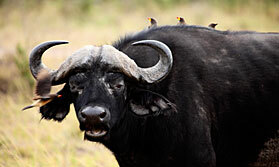 In the national park: Encounter Mara, Mara Explorer, Rekero Tented Camp. In private reserves: Kicheche Valley Camp, Porini Mara, Mara Plains Camp. 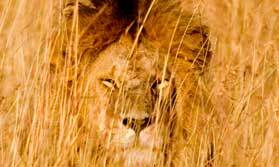 So talk to us about travelling to the Serengeti or Masai Mara to see this unmissable wildlife spectacle. But don't leave it until the last minute - it gets booked up! For more details about this read our post about the "Annual wildebeest migration"
The annual wildebeest migration can be seen in the Serengeti in Tanzania and the Masai Mara in Kenya. It depends on the time of year you're travelling as to which place you would choose. December-March: Southern Serengeti. (Calving and new borns). April-June: Herds head north and west. Serengeti’s Grumeti region is the place to be, but central Serengeti can also be very good. July-October: Northern Serengeti (inc Lamai Wedge) and Kenya’s Masai Mara. November-December: Wildlife heads south, mostly via the eastern side of the Serengeti. In Tanzania for most of our clients we arrange a private guide and vehicle, giving them the flexibility to watch wildlife for as long as they want and stop when they want. 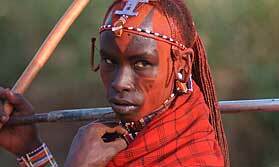 In Kenya this is also possible, though it is more common to fly into the Mara and take game drives with the guides from the camp or lodge.